Here begins the story of George Cockram, a little bit at a time. He was the fifth child of William Cockram and Prudence Yeo – or maybe not. He was certainly Prudence’s fifth child, but the father of her first child, Elizabeth, is anyone’s guess. 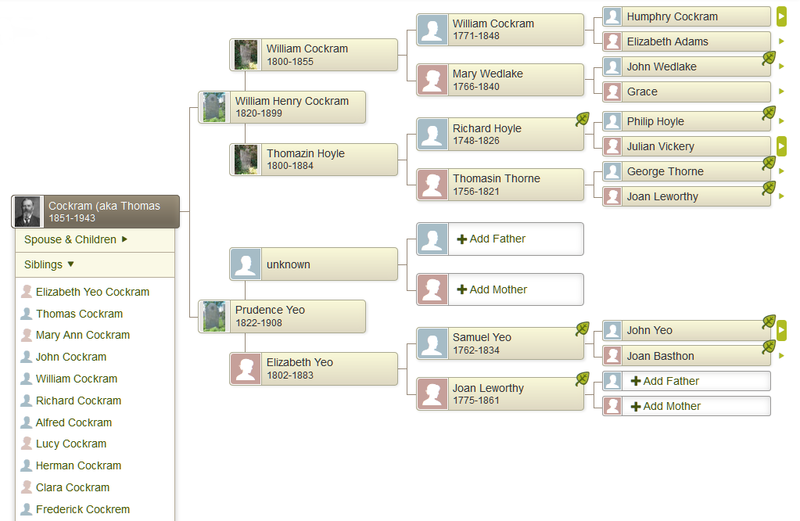 And by the way, Prudence herself was one of two illegitimate children of Elizabeth Yeo. It’s amazing how many of my ancestors were born on the wrong side of the sheets. I don’t know if George ever knew about the unauthorized activities that his mother and grandmother got up to, but if he did, was he so outraged that he changed his name to distance himself from them? I doubt it, particularly when I remember that he named one of his daughters Prudence and another Elizabeth. Here's a screen clip from my Ancestry tree, showing some of George's ancestors, and his siblings. Click on it for a larger version.